… on order as an integral part of the full Irish breakfast, kettle on the boil, PG Tips sitting eagerly in the teapot, NHT speakers hooked up, yes, we’re back on the road. There’s that whistling wind again, stronger than yesterday I’m sure. Ah well, at least the sun is out…no, it’s gone….wait, it’s back again…. whatever. I’m looking forward to what the day brings forth. My first web search of the day reveals… Cool and windy, with strong to near gale force west to northwest winds gusting up to between 80 and 100 km/h. Heavy, possibly thundery showers. Once breakfast was dealt with it was time to hit the streets of Dublin in search of more appropriate Autumnal wear, we’re so use to touring in the Summer the suitcase is horribly lacking in the keep-warm department. I throw what I can find on in multiple layers and wander out. It’s still a shock, since the wind has now shifted a little more Northerly, the temperature has plummeted. Shopping here is always excellent and in no time I’m the proud owner of a proper jumper. Sound check was scheduled for 5:15pm ish. The ish is there as it’s an unknown situation and we hear that Bob is going to soundcheck before us. Probably because it’s the first show of a new leg of the tour for Bob, he does indeed soundcheck and runs some what I assume were new arrangements. Unfortunately it meant that there was very little time for us to do anything, not that that is in the slightest way an issue, the production simply held the doors for a few minutes and we did a few bars of the opening tune for tonight just to ensure everything was working OK. It was. Then it was a quick trip to catering where I had a delightful ‘Bearded Cod’…or is it Breaded Cod, not sure, my eyesight isn’t what it was. Anyway, it was delicious and a perfect light pre-show meal. Before we knew it we were dressed and ready for our 70 minute stint. We took to the stage and off we went. 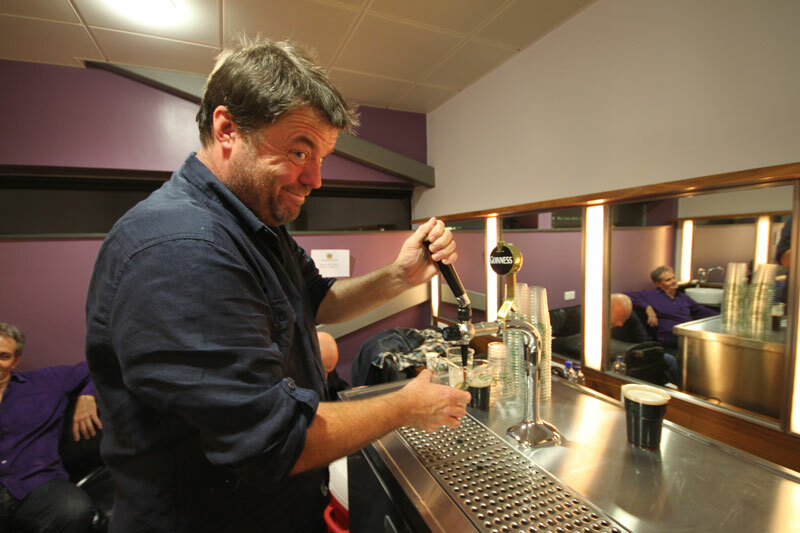 The show was so much fun and as Richard has pointed out in his notes, it’s like a we’ve just continued on from the last tour, except better. With a few new songs interspersed in the set, the whole thing was over before we knew it. 70 minutes can absolutely fly by. We were done and the call was given to turn the stage around. The two stage crews were all over the place like ants and at some point during this trip, I will focus on that as the speed with which they manage the turnaround is something to behold and I can guarantee it’ll get quicker as the tour goes on. In the meantime, our band were escorted back to our dressing rooms where our beloved Peter Mackay had a little local surprise waiting for us. Our own Guinness Cow (as Richard so aptly christened her) A portable, self-contained Guinness bar. Not long after we’d hung up our stage shirts, we could hear that Bob had taken to the stage and a few of us wandered out into the auditorium to have a listen. Bob Dylan and I share the same birthday but for 70 years old, Bob is a demigod. 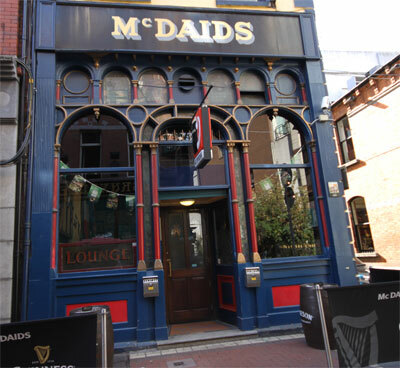 Then it was back to the hotel before the gig traffic and a quick nightcap in McDaids, right across from the hotel entrance. Clearly one of the most popular pubs in the area, the place was heaving so I put that new jumper to good use as we stood outside and chatted and enjoyed quite possibly one of the best pints of Guinness EVER.